While a bit denser than Maurice Sendak’s modern bed-time story, medieval bestiaries were, and still are, crowd-pleasers. A bestiary is a collection of short descriptions about a wide variety of (real or imagined) animals, birds, and in some cases, even rocks. These entries were often accompanied by fantastic illustrations which no doubt entertained their intended audience nearly as much as they appeal to today’s tumblr fans. Concerning the natural world, bestiaries were never intended to be scientific; instead the entries were moralizing and religious allegories. This bizarre crocodile will eat this man, then cry as it is wont to do. Morgan Library, MS M.81, Folio 70r. The lion, King of Beasts, before Christ in the Bern Physiologus, c. 830, Reims. Bern, Burgerbibliothek, Cod. 318, f. 7r. 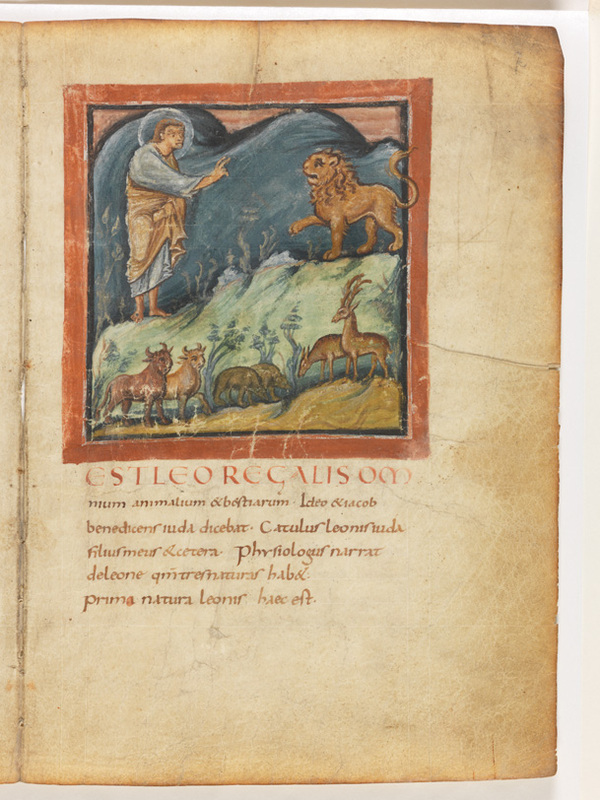 Works by Ambrose of Milan (4th c.), Isidore of Seville (7th c.) and others were incorporated into bestiaries, increasing their Christian allegory and resulting in an ever-evolving genre. More animals were added to the original 50 of the Physiologus, many of which were clearly unfamiliar to the monks who compiled and illustrated these texts. 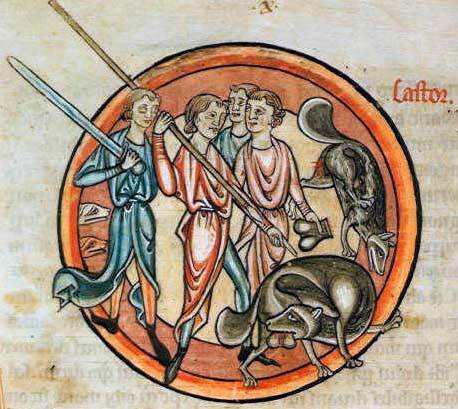 Reaching their peak in the 12th and 13th centuries, over 150 bestiaries survive. Despite growth in hermeneutics, content, and popularity, the “factual” information generally stayed decidedly unscientific. To the modern reader, some bestiary descriptions are almost ridiculously entertaining. One of my favourite common entries concerns the ape, which is usually accompanied by a miniature showing a mother ape fleeing a hunter . 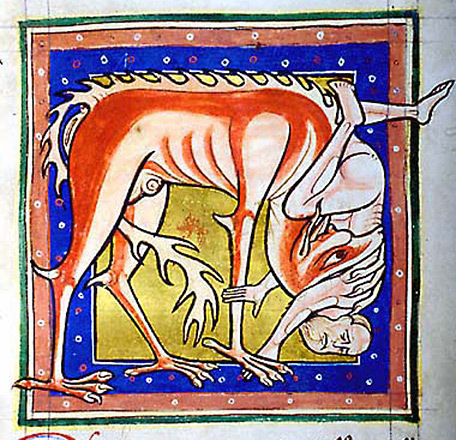 The Aberdeen Bestiary, c. 1200. Aberdeen University Library, Univ. Lib. MS 24, f. 12v. 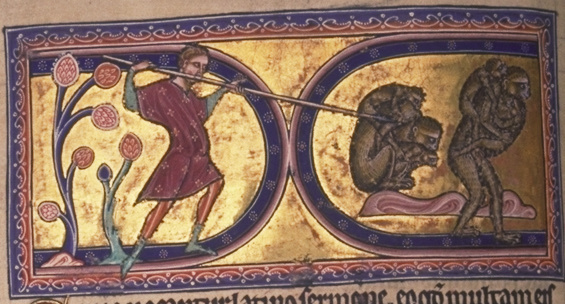 Another interesting and common story, as depicted below in the Harley Bestiary, is that of the beaver. According to most bestiaries, the beaver was primarily hunted for its testicles which were thought to have medicinal properties. If cornered by a hunter, the beaver will gnaw off its own testicles and toss them to the hunter to end the chase. If pursued again, the beaver displays his lacking parts to secure his escape. A grisly scene, sure, but this provided a useful ascetic lesson: if a man wanted to live a chaste life, he must sever his vices and throw them in the devil’s face. Seeing that the man has no vices left by which the devil may control him, the devil will let him be. 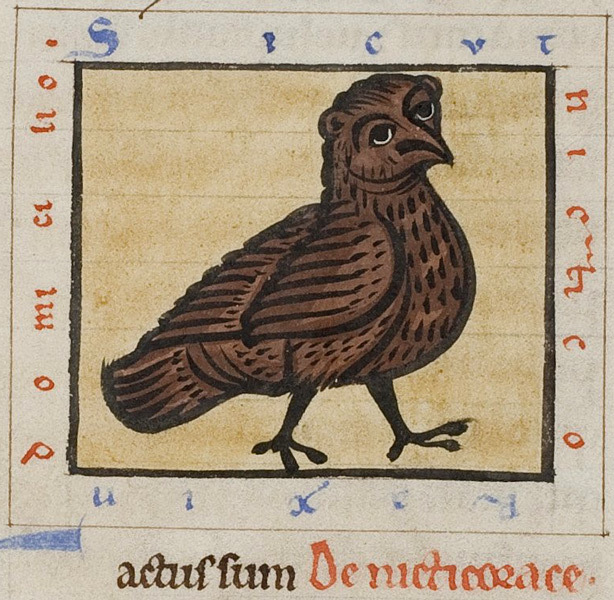 The Harley Bestiary, c. 1230-1240. British Library, Harley MS 4751, f. 9r. While we might find some of the bestiary entries so obviously preposterous, it matters little whether or not medieval readers believed the accounts. Scientific edification was not the point; spiritual enlightenment was the goal. So, whose spiritual development was targeted? Generally, bestiaries were engagingly illustrated, entertainingly written, and intellectually accessible, which likely contributed greatly to their popularity and the diversity of their audience. Most surviving medieval bestiaries are written in Latin, and were made and used within monasteries (indeed like most manuscripts). Additionally, from the early 13th century onward, vernacular language (especially French) bestiaries were introduced, making the genre more accessible to a non-monastic audience. Many have argued that these were used as didactic tools during sermons and instruction of lay people, while new versions such as Richard de Fournival’s Bestiaire d’amour (c. 1290) were read more for entertainment. Willene Clark successfully reasoned that Hugh de Fouilloy’s De avibus (c. 1160), which was often incorporated into bestiaries, was intended to instruct lay-brothers. An excellent example of this Aviary comes from the scriptorium of Ter Duinen (the focus of my dissertation) c. 1190-1200. It’s likely that it was indeed somehow employed in teaching Ter Duinen’s numerous lay-brotherhood. The “night raven” owl in the Ter Duinen Aviary. Grootseminarie Brugge, MS. 89/54, f. 5v. The popularity of bestiaries in the Middle Ages is unsurprising to me. It’s also easy to see why they have become so popular today; from digital facsimiles and online scholarly projects to tumblr pages and facebook feeds, medieval animals practically leap from their manuscripts to our computer screens. This is in fact my computer desktop image. 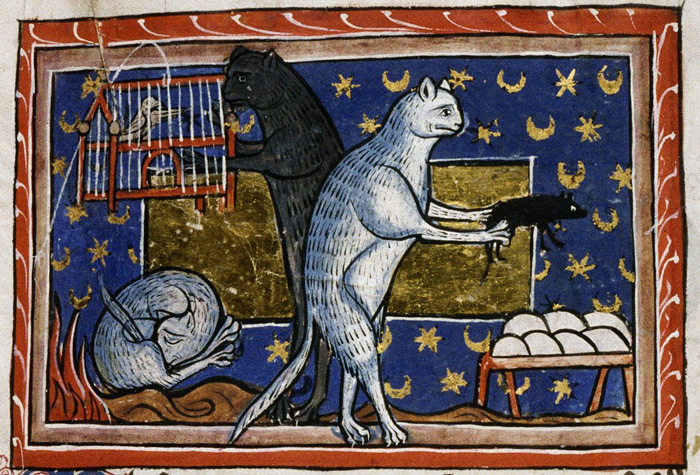 Cats being cats, c. 1225-1250. Bodleian Library, MS. Bodley 764, f. 51r. This entry was posted in Jenneka Janzen and tagged Animals, Art History, Bestiary, Manuscript, Medieval Illumination. Bookmark the permalink.